On Sunday September 30th again thousands of protesters and supporters joined the forest walk. Again thousands broke away from the official demonstration route and went into the forest. Many re-errected barricades and dug ditches to make it more difficult for the machines to evict the remaining tree houses Paragraph11 and GhostTown. Possibly more tree houses are currently being erected. Dirk Jansen, head of the environmental organization BUND in North Rhine-Westphalia, says that Hambacher Forest is not yet lost. The BUND filed law suits concerning the environmental status of the forest. If the court of justice agrees that the government would have needed to declare the forest along the flora fauna habitat directive (FFH-Richtlinie) of the European Union the forest will survive. A similar BUND law suit prevented the forest from being logged last winter. Despite these legal facts the power company RWE as well as the minister of the interior of North Rhine-Westphalia, Herbert Reul (CDU) claim there was no way the forest could survive. Do they think they don’t need to wait for the court of justice to decide on October 14th? The interview took place at the forest walk around Hambacher Forest on September 30th, 2018. Peter Wohlleben is forester and the author of the book “Secret life of trees.” He told me that only 0.3 percent of the forests in Germany are old decidious forests like the one in Hambach. Reforesting a forest, as RWE is doing on the other side of the lignite mine, is impossible. The ecosytem and soil infrastructure will take hundreds of years to regain their current strong quality. Wohlleben is confident that we have reached a turning point in climate activism in Germany. I agree. 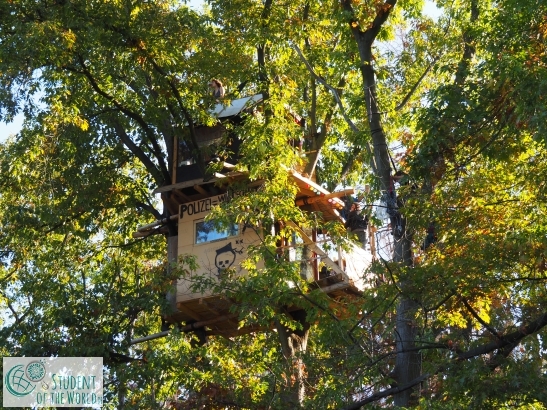 When the evictions started on September 12, 2018 the police often spoke of around 50 tree houses while activists claimed to have built around 60. Now the police states they had already evicted and destroyed 77 tree houses out of what they initially thought were around 60. There are two interesting things: The police now “forgets” that they made the resistance smaller than it actually was by claiming they had always thought of 60 tree houses instead of 50 (as police initially anounced). And around 17 tree houses were newly built within the past 2,5 weeks! The activists achieved this under difficult circumstances. The police frequently checked bags for tools and climbing equipment. It was impossible to bring in new building material like palettes into the forest by car. The activists still achieved to build so many new tree houses and platforms. Reportedly there were some carpenters around who were on the “Walz” – a tradition for craftsmen and -women that originated the Middle Ages and makes craftsmen and -women travel from one construction site to the next for up to three years. That and the many people who helped erect barricades and supported in any possible way show the very strong backing from the “normal” middle-class population. Sign me up for the Student of the World newsletter! If you don't want to miss any news, sign up to my newsletter. ssempijja wicklif on Planting Trees. Planting Life.